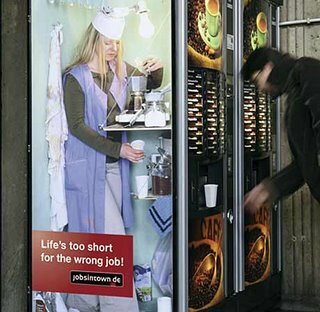 Check out the ad on the side of this coffee vending machine. It’s a print ad for the German job site Jobsintown.de. This series of ads are placed on the sides of different vending machines, making it look like someone is sitting inside making coffee or doing whatever task the machine automates. Pretty inventive; I love it. Thank you for visiting and commenting on my blog Blogger for Dummies. Looking forward to your visits again. Just to let you know Blogger for Dummies may not be updated but all new posts for the time being will go to Blogger Tips and Tricks while I ponder what to do. This is because of trademark issues.